1 July 1944. 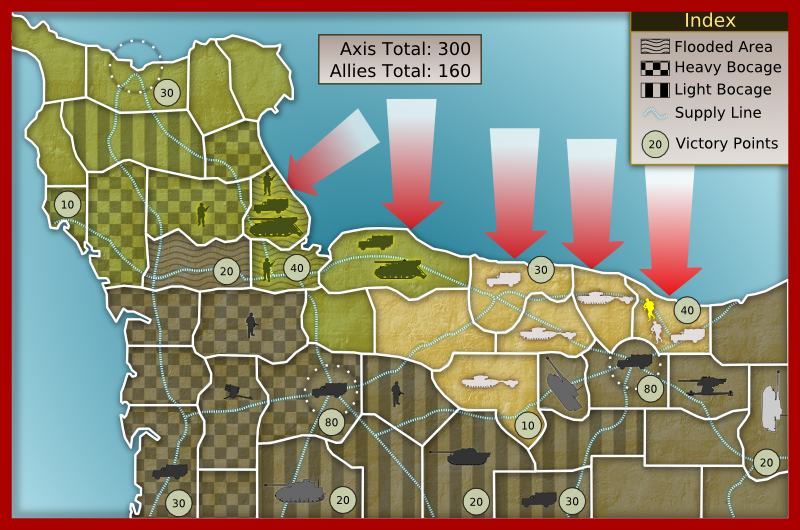 Cherbourg has fallen and the Allies are poised on the outskirts of Caen and St Lo. However, the German defenders refuse to yield ground and the fighting has been brutal and deadly in the bocage and around the villages bordering Caen. The Allies' assault hit stiff defences along the entire front and many important territories were lost including Carentan which was taken by elements of 17. SS-Panzergrenadierdivision supported by Fallschirmjäger. Villers-Bocage also fell into Axis hands during an Exploitation move in the Strategic phase. All was not lost for the Allies as they were able to take the vital crossroads at Le Haye de Puits and expand the bridgehead over the Orne sealing their eastern flank. A deep penetration toward the vital supply route at Le Beny Bocage, however, was cut off and surrounded.